Home aquarists come to us all the time with statements like “My fish are sick” or “All my fish are dying” and then ask, “How should I treat them?”. Of all the afflictions described and shown to us, there are two that are the most common: Marine Ich and Marine Velvet (caused by Amyloodinium sp. and will be discussed at a later date). Marine Ich is caused by an infestation of the protozoan Cryptocaryon irritans and can be deadly. Symptoms of this infestation include flashing (scratching against substrate or décor), rapid respiration, increased mucous layer, abnormal swimming, loss of appetite, or frayed fins. The most telltale sign of C. irritans is the characteristic white dots that are most commonly compared to grains of salt stuck to the body of the fish (SEE FIGURE 1). However, a microscopic examination is the most foolproof method to diagnose 100% accurately. Cryptocaryon irritans will infect just about any teleost fish in a tropical marine environment, though some fish are notorious “Ich magnets” (i.e. surgeonfishes including Paracanthurus hepatus the Blue Hippo Tang). It is usually brought on by environmental triggers or poor water conditions; changes in water temperature, high levels of ammonia, nitrite, nitrate, low pH levels, low dissolved oxygen, as well as overcrowding. These factors all cause stress to fish allowing for a decreased immune system and the onset of disease. To be completely honest, Ich is rare in the wild, and much less likely to be lethal there. Keeping up on tank maintenance, excellent water conditions, and proper diet are the best way to stay Ich free! In order to better understand how to treat this disease, it is necessary to know a little bit about the lifecycle of C. irritans (SEE FIGURE 2). 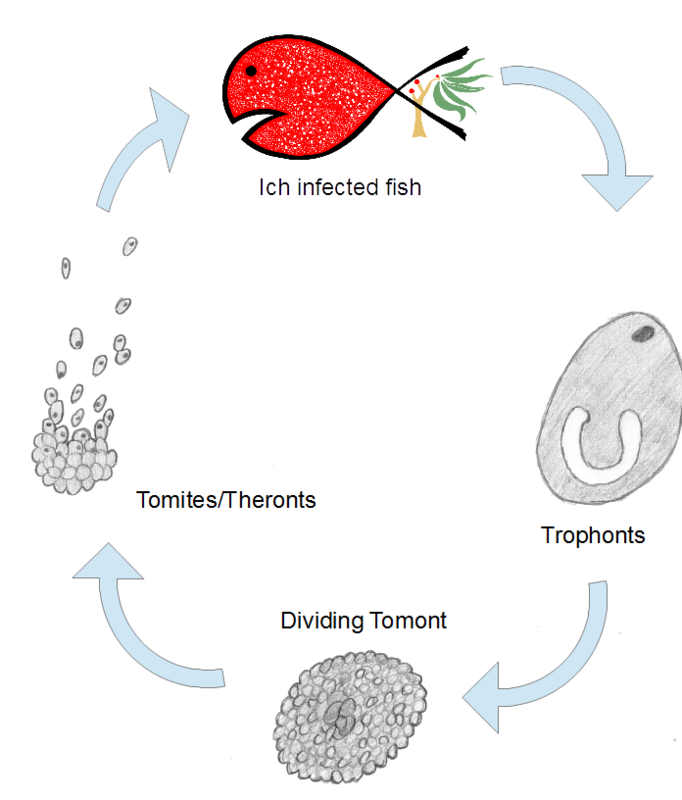 This parasite has a number of different stages within the life cycle: protomont (crawling adult), tomont (cyst), tomites (daughter parasites), theronts (free-swimming), and finally a trophont (adult stage attached to the host). Basically, a trophont will spend 3-7 days feeding on its host, your fish. Afterward, it will drop off (usually under the cover of darkness when the fish is resting) and spend up to 18 hours crawling along the substrate (protomont stage) until it attaches to the substrate and begins to encyst (tomont stage). Next, the parasite will divide into hundreds of daughter parasites (tomites) within the cyst and can remain there for up to 28 days (don’t be lulled into false security during this stage, follow the full treatment protocol)! Finally, the cyst will hatch, releasing free-swimming theronts that need to find a host within 24 hours (This is the most vulnerable stage and most treatments target the theronts). Normally, this parasite will attach to skin and gill tissue where they can transform into adult trophonts. And round and round the cycle will go. According to past studies, the number of parasites can multiply ten-fold every week! Eeeek! Preventative measures are, of course, the best way to fight C. irritans. Your tank should be set up with the appropriate equipment (efficient filtration, protein skimmers, and U.V. sterilization depending on your set-up). If you have questions about proper equipment, one of our M-1 Certified Aquarists will be able to guide you. Be careful when mixing fish from the Caribbean and Indo-Pacific. Studies have indicated that problems could result when fish have limited immunity against a native variety of Ich and then encounter a foreign variety (even though ‘technically’ there is only one species). Quarantine tanks without substrate (bare-bottomed), that are plumbed separately from the main aquarium, and have non-porous decorations (i.e. PVC piping) is the ideal way to introduce new fish to your masterpiece no matter where you get your fish from! Quarantine all new fish for at least one full month to give them time to get over any shipping stress and give any parasites enough time to cycle through the stages and leave the fish. Once in your main display aquarium, keep in mind, a fish is only as strong as its immune system and will function best with good water conditions and a healthy, varied diet. We have had much success preventing and treating illness by enhancing fishes’ diet. With these preventative measures, you can avoid introducing Marine Ich to your home aquarium, however, if you do wind up with an infestation there are many different treatment options available. A few of the most commonly recommended treatments are listed here, however the literature does support other options. Hopefully, one of these treatments will best suit your tank to result in happy healthy fishes. presenting symptoms of an Ich infection. Copper is highly effective for treating Marine Ich when dosed and maintained properly. It targets only the infectious, free-swimming theronts stage. Again, always follow the directions from the manufacturer and be sure to test your copper levels to ensure you are within the proper range of effectiveness. Invertebrates cannot tolerate ionic-copper and certain fishes are sensitive to it (including mandarins, lionfish, and seahorses). Crushed coral and coral skeletons can absorb copper. Be careful NOT to overdose your tank and test water frequently! Cupramine (which Seachem carries) is ionic ‘bonded’ copper and is highly effective. 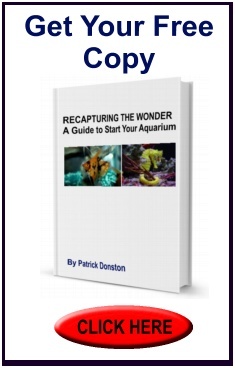 Cupramine will not precipitate out of your aquarium and will remain there to treat infestations until removed. Malachite Green is usually available at specialty fish stores and can help in the treatment of Marine Ich, as well as other ectoparasites and external fungal infections. Though some blogs have stated that this product is reasonably invertebrate safe, the directions explicitly say to remove fish to a quarantine tank. It can also be used as an additive to freshwater dips. The temperature in any tank may temporarily be raised slightly (roughly 82° Fahrenheit) to speed up the life cycle of Cryptocaryon irritans and allow medications to work faster. Keeping hyposalinity (1.009-1.010 specific gravity) for two weeks may aid in killing stages of C. irritans (bring the specific gravity back slowly to avoid extra stress to your fish). The theory here is to conserve energy normally used for osmotic regulation and allowing the fish to use that energy to fight off the disease. This is something we practice in our own system. In addition, frequent water changes (up to 50% every few days) could help remove theronts from the water during a break out. Don’t’ forget to replace water at the same salinity and temperature. Kick Ich – According to our most experienced aquatic specialists, this is the “safest” medication for a reef tank. It is a water treatment, with the active ingredient 5-Nitroimidazoles, that claims to be safe in any marine aquaria including reef tanks. It specifically targets the free-swimming stage of Ich without harming invertebrates in your tank. Hikari Ich-X – Ich-X uses a ‘less toxic’ form of malachite green and has been argued to be more effective than Kick Ich. Though this product is supposed to be safe in a reef tank, the directions recommend using it in a quarantine tank. Follow the directions carefully and do not skip the water changes recommended or your corals may suffer. Exoden – This product is really to be used only in a FOWLR tank and has been rated as highly effective in treating Cryptocaryon irritans when dosed just before lights out. Since it can harm invertebrates (especially your coral), do not use Exoden in reef tanks. Don’t be afraid of fresh water dips! If you can catch your fish out of your aquarium, this treatment can help with the fish against Cryptocaryon irritans. At the very least, fresh water dips have been proven effective against Amyloodinium, “Black Ich ” (Turbellarian Worms), some Flukes, and Uronema. Be sure to match the parameters of your aquarium to limit stress to your fish. Though some fish can tolerate longer dips, 5-10 minutes should be effective. Most casualties only occur when a fish is too far damaged, and not directly a result of the dip. A Puffer showing signs of an Ich infection. Some fishes excrete toxins when stressed (six-line grouper, mandarins, boxfish, etc.) so be careful when dipping them. Observe your fish closely! Fish can show stress many ways, but signs of trouble are when fish jump out of the dip or are spitting water. You could also add methylene blue (the “old time” method for treating Ich) to the dip. This is an anti-microbial dye that is effective against many secondary infections that could occur as a result of an already suppressed immune system. Fresh water dips could also be used as a preventative measure when introducing fish as part of your normal quarantine routine. These are good options when it is difficult to remove your fish from the aquarium, but should be used as a secondary treatment. It will also work as a preventative for mild infestations. Dr. G’s – Dr. G’s Anti-parasitic frozen food has the active ingredient Chloroquine Phosphate and has been shown to support freeing parasites from fish (including, Marine Ich, Oodinium, Brooklynella, etc.). However, as with any food-based medication, this should not be the only treatment. Even Dr. G states that you should use his product while you dose to help eradicate Cryptocaryon irritans quicker and more effectively. Metronidazole– Metronidazole (a.k.a. Flagyl) has been shown to be effective in fighting Cryptocaryon irritans. This of course will only help when the fish is actually eating food. Seachem carries Metronidazole and can be added to fish foods with the help of a binding polymer called Focus. Another product, Metro Plus, by Hakari claims that they already have the binding polymer in their product and ready for use. Garlic – Garlic is another alternative preventative treatment to avoid Cryptocaryon irritans. Garlic has been shown to contain anti-bacterial, anti-fungal, anti-parasitic, and antiviral properties in recent studies. It has been used as an intestinal de-wormer against nematodes and cestodes in the past. Mainly garlic has natural antioxidant properties to help boost the immune system. It is most effective when used as a food soak; there are garlic products that are made to soak pellets and freeze-dried foods. Ginger is the newest homeopathic treatment to be suggested though there is little proof that it actually works. Pepper-Based Medications – Pepper-based medications work by increasing the mucus layer response from fish, which supposedly can slough off parasites and prevent re-infection. Kent used to carry a pepper extract product called “RXP” that was very effective in treating Ich in FOWLER tanks. The only down side was that it smelled like mace. Unfortunately, it was discontinued a while back. Many hobbyists seek out biological controls to solve aquarium problems such as C. irritans. Cleaner wrasses, Labroides species, are often sought after for their diet of marine ectoparasites, however, the vast majority of these are doomed to waste away, as they normally will not take in prepared foods. There are many other effective cleaners available with a much better survival rate. Using cleaner shrimp may help with a mild case, but will not fully cure a full-blown infestation. Other cleaner fish include various Gobiosoma species. While these make excellent aquarium residents (since they will take in other foods), they are not an effective cure for parasitic diseases of fish alone. Hopefully, you now have a little more understanding of the biology and treatments available for Marine Ich. Remember, the best way to fight Cryptocaryon irritans is prevention and a stable environment with regular maintenance. If you have any further questions about fish disease, always feel comfortable asking a professional or an Absolutely Fish M-1 Certified Aquarist. Andrews, Chris, Neville Carrington, and Adrian Exell. Manual of Fish Health: Everything You Need to Know about Aquarium Fish, Their Environment and Disease Prevention. Richmond Hill, Ont. : Firefly, 2010. 166-95. Bassleer, Gerald. Diseases in Marine Aquarium Fish: Causes, Development, Symptoms, Treatment. Westmeerbeek, Belgium: Bassleer Biofish, 2000. 88. Bunkley-Williams, Lucy, and Ernest Williams. “Disease Caused by Trichodina Spheroidesi and Cryptocaryon Irritans (Ciliophora) in Wild Coral Reef Fishes.” Journal of Aquatic Animal Health 6 (1994): 360-61. Burgess, P. J., and R. A. Matthews. “Fish Host Range of Seven Isolates of Cryptocaryon Irritans (Ciliophora).” Journal of Fish Biology 46.4 (1995): 727-29. Burgess, Peter, and Angelo Colorni. “Cryptocaryon Irritans Brown 1951, the Cause of ‘white Spot Disease’ in Marine Fish: An Update.” Aquarium Sciences and Conservation 1 (1997): 217-38. Colorni, A. “Aspects of the Biology of Cryptocaryon Irritans, and Hyposalinity as a Control Measure in Cultured Gilthead Sea Bream Sparus Aurata.” Diseases of Aquatic Organisms 1 (1985): 19-22. Colorni, Angelo. “Biology of Cryptocaryon Irritans and Strategies for Its Control.” Aquaculture 67.1-2 (1987): 236-37. Gratzek, John B., and Janice R. Matthews. Aquariology: Fish Disease and Water Chemistry. Morris Plains, NJ: Tetra, 1992. 107. Noga, Edward J. Fish Disease: Diagnosis and Treatment. Ames: Iowa State U, 2000. 97-99, 282-283, & 286-288. Untergasser, Dieter. Handbook of Fish Diseases. Neptune City, NJ: T.F.H., 1989. 95 & 127.